Lose 5 kilos in 30 days. It sounds straightforward and it is. 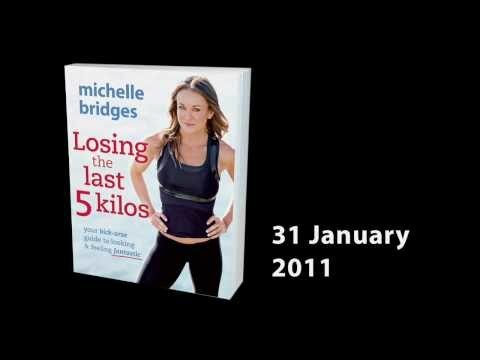 Michelle Bridges is Australia's most successful weight-loss expert and she knows how to get people into shape quickly. Whether your weight has been slowly creeping up over the last few years, you've already lost a lot of weight but can't get any further, or summer is just around the corner and you want to look your best, Losing the Last 5 Kilos gives you all the information you need to get back to your perfect size. So, set aside 30 days to follow Michelle's training program and menu plan. Do this for just four weeks and watch the kilos disappear. You will look and feel fantastic. Michelle's program is like nothing else. It's like there was one single piece of information that my brain needed to figure out to understand what losing weight was all about – and I sure found it. Michelle Bridges has worked in the fitness industry for eighteen years as a professional trainer and group fitness instructor. Her role as a trainer on Channel Ten's hit reality weight-loss show The Biggest Loser has made her Australia's most recognised personal trainer. Michelle has travelled the world presenting at global fitness conventions and competing in physique and fitness competitions, and is sought after as a motivational speaker. Losing the Last Five Kilos is her third book. Her first two, Crunch TIme and Crunch Time Cookbook, were bestsellers. It's simle, it's easy to follow, and it works! If you follow the program you will lose weight. The dishes are simple, fast and tasty. The whole family enjoyed the food! Great inspiration to change my routine, tone up and slim down. The recipes in this book are easy to follow and not complicated yet they make incredible meals. Michelle Bridges has worked in the health and fitness industry for over twenty years as a professional trainer and group fitness instructor. Her key role in Network Ten's hit series The Biggest Loser combined with her highly successful online exercise and mindset program, the 12 Week Body Transformation, has connected her with hundreds of thousands of Australians, making her this country's most recognised and influential health and fitness personality. Her books, including Crunch Time, Crunch Time Cookbook, Losing the Last 5 Kilos, 5 Minutes a Day, The No Excuses Cookbook, Everyday Weight Loss, Your Best Body, Get Real!, Superfoods Cookbook and Total Body Transformation are all bestsellers.